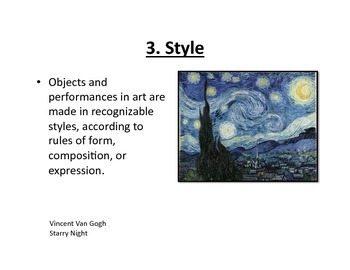 Some of the information in this presentation comes from "The Art Instinct" by Dennis Dutton. 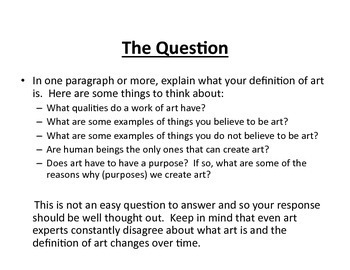 It outlines the 12 qualities that a work of art may have and is prefaced by a short essay writing prompt for students. My personal feeling is that saying "everything is art" is a cop out. How do you define it? What qualities should it have? 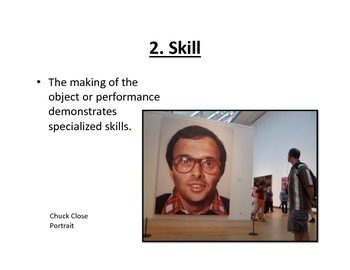 What makes some art better than others? It was originally a PowerPoint presentation, however the original file was corrupted. Included is the PDF version.